When the smartphone was first introduced into our lives, very few people could have expected the impact it would have on society. It seems that our phones have evolved from simple communication tools to personal assistants who cater to our every whim – from reminding us of our daily tasks to keeping us entertained when we get bored. This phenomenon is in no small part brought about by the advent of applications that flooded the market as soon as the first smartphone was released. Though many applications have been created to fine-tune human productivity, many developers have gone the other way and decided to cater to the consumers need to reset and relax. Thousands of applications have been developed to make sure that every-inch of your mind and body is as relaxed as possible to keep you from burning out. We’ve listed some of the best relaxation apps that can be downloaded right into your smartphone. Yoga has long been revered for its relaxing effect on both the mind and body. The application teaches you all poses and gives you the option of playing your own music for a more personalized experience. With this application, you can get all the benefits of a full yoga treatment without having to get out of the house or paying for yoga sessions. You can download it now for $0.99. There have been many applications that have tried to create a magazine experience right in your phone or tablet but none have quite made it as simple, customizable and beautiful as Flipboard. This beautifully made app synthesizes different articles from the world’s top publishers and conveniently categorizes them so that you only get the content that you want to read. It also syncs with Facebook, Twitter and Instagram so that your social media feeds can be accessed right on application’s interface for a totally complete experience. Get this great application for free! Enhancing brainwave activity to keep us focused or relax our minds seems like something out of a science-fiction movie but this application promises just that. 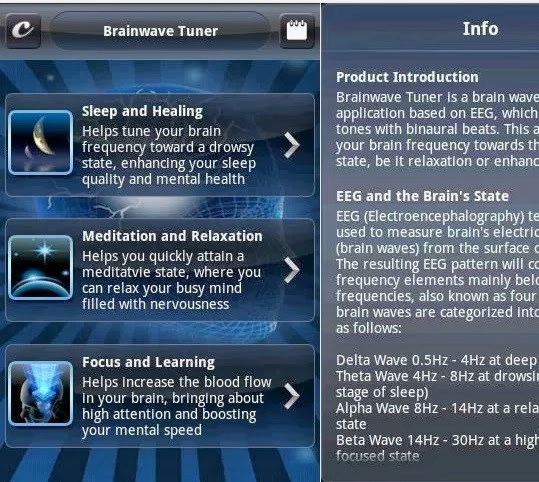 Brainwave Tuner plays beats and sounds that apparently enhance brain frequency for a multitude of purposes, whether it’s for sleeping, relaxing of focusing. The amount of time the sounds will play can be customized so that you make the most out of your study sessions or whenever you’re meditating. This application has a LITE version for free or $3.99 for the full version. We all know how hard it is to concentrate when there a thousand and one sounds playing simultaneously around you – be it barking dogs, the construction site across the road or your roommate watching TV in the other room. Ambiance allows you to download sounds to drown out everything in the background by playing ambient nature sounds to make sure that your mind is as relaxed and peaceful as possible. Get the LITE version for free or $0.99 for the full version. So give your RingCentral, Gmail and Facebook apps a break. Unwind with these relaxation apps and fuel up for another productive day ahead.